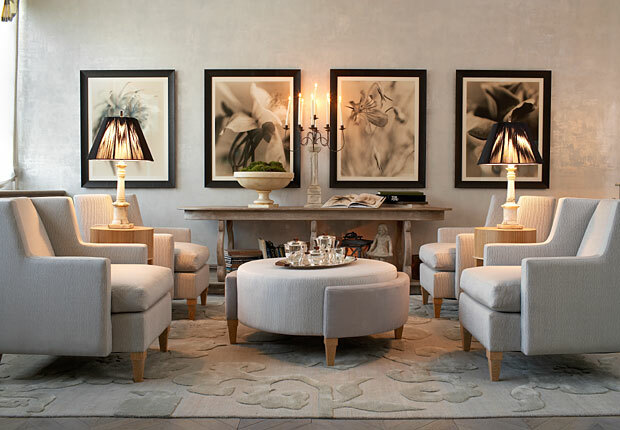 There is something comfortable about four lounge chairs sitting around an ottoman or cocktail table. It provides for great intimate conversation in a relaxed, stay awhile feeling. What a contrast to the stuffy traditional living room seating. But this can be tricky to achieve. 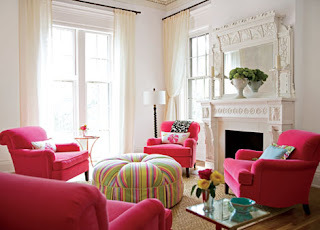 I am partial to coordinating mismatched pairs of seating, rather then four matching chairs. But in the right setting, the matched set can be impressive. And the ottoman or cocktail can make or break the look. 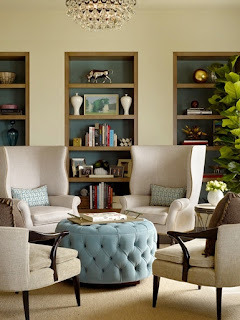 I do like this look with matching chairs when the cover is kept neutral. 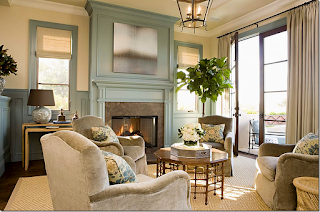 It provides a great contrast with the sisal carpet, fireplace surround, and window treatments. This arrangement can be accomplished for any design style. It can take the buttoned-to-the-collar stuffiness out of room while leaving in the sophistication.